I don’t know what kind of CRM software they are using over at Nokia HQs, probably none, because otherwise my e-mail address wouldn’t be registered with their nokia.com.my (Malaysia) website. Now, I’ve been to Malaysia once, as a child in 1981, but other than that and me taking part in a Nokia Malaysia competition many month ago, there is no other connection between them and me. Also, it is against this background (SE Asia, Malaysia), that I understand the Disney promotion within the cultural context. Their multiple databases online and the promotion of such BS software for any serious user are just two reasons why I am happy with my iPhone. 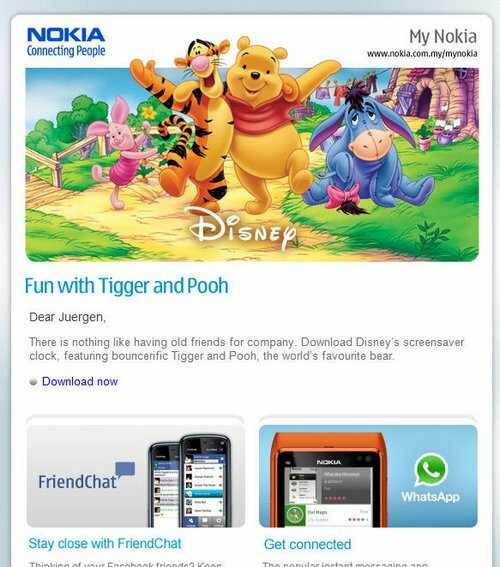 Just the other day it amazed me how quickly and without any regrets I managed to drop my Nokia fan boy thing, but looking at such e-mail spam I am just reassured that I took the right decision.